The logo for the 2017 Major League Baseball All-Star Game was unveiled during an on-field ceremony before the Marlins game against the Philadelphia Phillies earlier today in Miami. A large silver gradient-rich star is met by the primary colours of the Marlins current look — red-orange, blue, and yellow forms the main shape of the logo with the marlin from the team logo adjusted to perfectly form the top point of the star. The name of the event is laid out in black with blue, silver, and red-orange trim in the same font the Marlins use on their logos and uniforms with the year and host city above and MLB’s famous silhouette logo below in Marlins colours. And no, there’s no teal here. The look of the façade and interior of Marlins Park is meant to be echoed in the overall look of the logo as well as the rest of yet-to-be-seen All-Star marks, all of which were designed in a process which started “well over a year ago”. Despite all that time they only needed one shot to come up with the final logo we see here today. Despite being the first MLB All-Star Game ever to be played in the State of Florida the obvious images have not been included in the logo unveiled today, but Occi told us that we will see palm trees later on in some of the theme art, which would make up the signage you’ll see around Miami and Marlins Park leading up to the event. Nods to Florida and the Miami area were noted originally by the Marlins in their colour scheme also being used here, the red-orange for the sunsets and citrus industry, the blue for the sky and the sea, and yellow for the sun itself. And yes, that is indeed a MasterCard graphic right there on the primary 2017 logo (it’s their new logo too, in fact). You may have missed it but it was also eventually present in the 2016 All-Star Game logo. Part of a multi-year deal to be the presenting sponsor of the All-Star Game. The M/C mark will be back for the 2018 All-Star Game to be held in Washington but (as was the case in 2016 and again in 2017) you won’t see it anywhere on the field, on the players, or on retail merchandise. 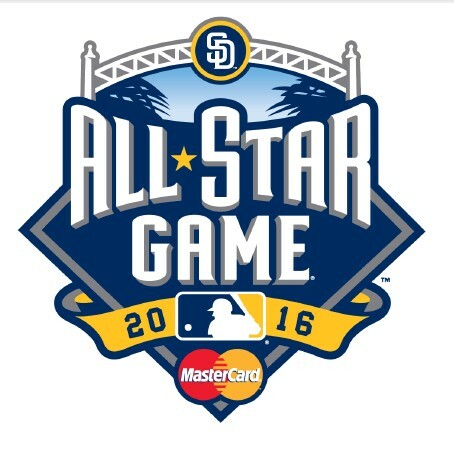 The MasterCard version of the All-Star Game logo will only be used for broadcast, print, and digital applications. You can all exhale now. The 88th MLB All-Star Game is set to be played at Marlins Park in Miami, Florida on Tuesday, July 11, 2017.